French President Emmanuel Macron Tuesday said allowing Iran to sell oil will be good for peace and will bring down oil price, few weeks away from expected U.S. sanctions on Iran oil. “It would be good for Iran to be able to sell it. 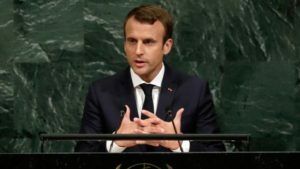 It’s good for peace and it’s good for the shape of the international price of oil,” Macron told reporters after he addressed the UN General Assembly in New York. President Donald Trump and his administration will on November 4, impose sanctions on Iran oil after reintroducing sanctions following Washington’s withdrawal from the 2015 nuclear accord. Washington has been bullying allies to stop buying oil from Iran expecting the move will further isolate the clerical regime in Tehran. France, Germany and the UK, all of them signatories of the nuclear accord, have been struggling to salvage the pact as they seek to continue dealing with Iran. In his address before the General Assembly, Macron called for dialogue and rapped Washington’s unilateral actions in relation with the agreement and the Iran oil boycott. “What will bring a real solution to the situation in Iran and what has already stabilized it? The law of the strongest? Pressure from only one side? No!” Macron said in his speech. Written by: KanelkaTagba on September 26, 2018. Posted by KanelkaTagba on Sep 26 2018. Filed under Headlines, World News. You can follow any responses to this entry through the RSS 2.0. Both comments and pings are currently closed.